Industrial Ear Piercing - Scaffold Or Construction Piercing Information. The piercing is made in the ear cartilage and you will have two piercings to look after while it heals. 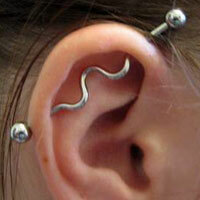 This piercing is also known as a Scaffold Piercing or Construction Piercings in certain parts of the world. This piercing can be either vertical or at an angle across the ear but it is most important that the correct length bar is used to prevent pulling on the piercings. The piercing although done with two separate piercings can have the long bar inserted at the time or two smaller bars can be used while it heals and then replaced with the longer one. Many people prefer to use a flexible bar initially either of PTFE, Bioplast or BioFlex. This helps with alignment issues and ensures that there is no pulling on the piercing that can occur when using a bar made of steel or Titanium. Like all piercings keeping the area clean whilst it heals is very important. It is quite a painful piercing and can take between 3 and 12 months to fully heal. Cleaning should be performed daily for the first few weeks and be sure to follow the aftercare advice given by your piercer. The industrial piercing is typically a 1.6mm (14 gauge) and bar lengths can be between 30mm and 50mm depending on the size of your ear and the direction in which the piercing is performed.